Phone charging is virtually what every phone owners do when their phone is low on battery after a while usage. In this modern era of smartphone manufacturing, phone OEMs are now making devices that come quick charge technology for faster charging time of a battery drained phone. And like many other people out there it is either you are currently using a smartphone with quick charge technology or you are using the regular smartphones without quick charge technology. But whichever smartphone that you are using, it is important to note that there is always a temperature build up during charging, as charging supplies current to the phone which increases the energy intake as well as raising the temperature of the device. A lot of people actually notice this increase in temperature on their device while charging as their device is heated up but they don’t actually know whether or not if their phone is overheating as a result of not knowing the actual temperature range for a charging phone to be declared as overheating. If you are in such category and you truly want to know if the phone that you are charging is overheating or not as a result of increased temperature, which is normal during charging then you are in the right place. In today’s post, we shall be telling you on how to know whether your smartphone is overheating or not while charging by giving you the actual and required charging temperature range. And by so doing, you will be able to tell whether that phone that you are charging is overheating or not. But before we proceed, it is important to note that most smartphones come with either Li-ion or Li-Po battery and again as we earlier mentioned that there are those with inbuilt quick charge technology while others lack such technology. As expected, smartphones with inbuilt quick charge technology charge faster when charged with its original and always recommended rated chargers, which are mostly rated 5V-2A (5 Volts-2 Ampere Current), whereas other phones without quick charge technology charge slower with their recommended rated chargers, which are mostly rated 5V-<2A (5 Volts – less than 2 Ampere current). Most times those phones with quick charge technology are built to accommodate higher temperature range during charging since the quick charge entails faster and more energy build up. So you normally notice that phones with quick charge technology get hotter while charging than those without. For those phones with quick charge technology, the normal charging temperature ranges from 0 degree Celsius to 45 degree Celsius, meaning that when your phone temperature start exceeding 45 degree C and hitting 50oC while charging, it a clear indication that your phone is overheating during charging. Now for those devices without quick charge technology, the normal charging temperature ranges from 0 degree Celsius to 30 degree Celsius, meaning that charging at considerably higher than 30 degree C tells that your phone is overheating while charging. 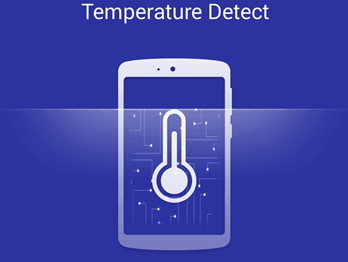 Finally, for you to measure your phones temperature at any particular moment, you might need one of the phone temperature measuring apps and for those on android, even the popular Security Master app can tell your phones temperature and also indicate phone overheating.